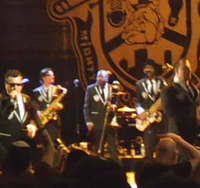 This past Sunday I went with a friend to see The Mighty Mighty Bosstones at the Boulder Theater in Boulder, Colorado. While it has been quite a while since I have done some serious ‘skanking’, it took no time at all to get back into it. The opening acts included The Dendrites and Bunny Gang (Featuring Nathan Maxwell of Flogging Molly), both of which are extremely talented bands, but I would have liked to see The Dendrites perform right before TMMB, as they were more of a high-energy brass band, rather than Bunny Gang, which was more of a mellow rock and killed the energy pretty quickly. TMMB played a large repertoire of their music, including the more well-known songs for those who may not have been as familiar with their stuff, but have seen the movies they’ve been featured in, such as Clueless. This was the first time I have seen them live and I certainly was not disappointed. I danced my heart out and left sweaty and happy. I would highly recommend seeing them in concert if you get the chance.